1. Distress the edge of a piece of the 6x6 map paper and adhere to the card blank. Use your fingers distress the edges in parts. 2. Cut a piece of the green backing paper 11.5 x 11.5cm distress the edges and adhere to the card at a slight angle. 3. Cut a piece of kraft cardstock 9cm x 9cm adhere to the card using foam tape, leaving the right side open. 4. Cut a piece of pink backing paper 8.5 x 8.5 distress the edges and adhere to the kraft card. 5. Die cut and build the Eiffel tower die, adhere to the front of the card. 6. Cut a piece from one of the green doilies and adhere to the left side of the card. 7. Cut a 5.5 x 9cm piece of kraft card, adhere a piece of 5x8.5cm green backing paper to it. 8. Punch two red hearts adhere to the front and back of the tag, stamp the sentiment onto white card and glue onto the tag. 9. Punch another heart and adhere to the left corner using foam squares. - First Edition Lock and Key, Nesting Stamp, Tags & Alphabet die set. 1. Cut two strips of white cardstock one 8cm x 32cm and another one 8cm x 24cm. Score each piece at 8cm intervals. 2. Adhere the two pieces together by joining at one end. 3. Cut 6 pieces of the red polka backing paper7.5 cm x 7.5cm and adhere to the cardstock. 4. Cut another square of the red polka backing paper 7cm x 7cm, cut it in half diagonally. Adhere half to the second and forth section of the card to make two pockets. 5. Cut two strips of red polka paper 7cm x 4cm, adhere to the 3rd and 5th sections of the card, to make two more pockets. 6. Punch 4 red hearts using the Fiskars punch adhere to the pockets adding a gem to the first and third heart. 7. Die cut the letters I and U using the alphabet dies and adhere to each side of the second heart. 8. Die cut various tags using white card stock, add ribbon and twine. Write a message on each and place inside the pockets. 9. Stamp the Love You sentiment, cut out and adhere to the last square. 11. For the first square cut a length of ribbon approx 56cms. Close the concertina book and wrap the ribbon around so that both ends meet on the right side of the book. 12. Adhere the ribbon in the centre of the front of the book. Die cut the smallest nesting stamp die using the First Edition red cardstock. Adhere the nesting stamp die cut using foam pads. 13. Decorate the stamp cutout with a die cut heart from the lock and key set. Add three gems to the top right corner. 1. Punch 72 hearts using different backing papers. 2. Place two hearts together and stitch, making 5 strips of hearts. 3. Open out the hearts to create a 3d effect. 4. Cut two strips of Kraft card 4cm x 30cm, cover using the red spot paper, adhere together at both sides to make a circle. 5. Hang four strips of hearts around the kraft card. 6. Add two pieces of ribbon to the top joining on both sides, tie another piece of ribbon around the top to hold the ribbon together, making sure that the mobile is balanced while doing this. Attach one strip of hearts to the ribbon to hang in the centre of the mobile. The best way to attach this is by sewing it to the ribbon. 7. Adhere red spot paper to the inside to cover up the workings. 8. 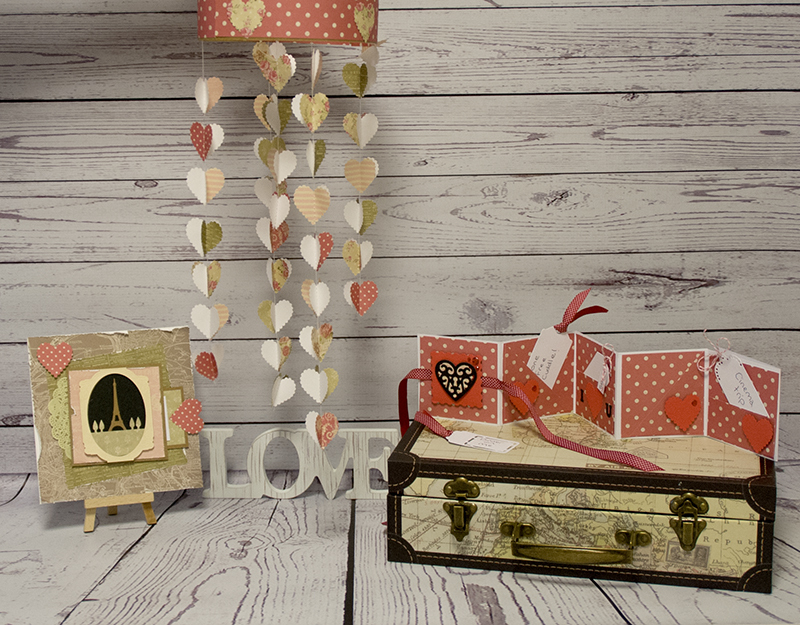 Add some die cut hearts to the outside of the mobile to finish. We love these cute ideas for Valentine ’s Day, handmade gifts are sure to make someone special feel loved, share your Valentines makes with us in the Inpsiration Area.